Barbs, Tetras, Rasboras, and even goldfish are among the most well-known egg scatterers. These fish need a specially prepared tank for the breeding process. Suitable tank sizes for the egg scatterers are 3 to 15 gallons for tropical fish, according to the size and nature of the fishes, with larger tanks for goldfish. Small light tanks are easier to clean and set up than heavy ones. Since we are not concerned with cultivating infusoria and beautiful live plant displays in our breeding tanks, the size of the tank matters little at the spawning stage, as long as there is room for the parent fishes to follow their particular routine. Later, the fry can be moved to a larger tank if necessary. We recommend that you purchase several new 10-gallon tanks to be used exclusively for your breeding and fry raising activities. The 10-gallon size is the most commonly available and economical aquarium size and is usually available on sale from time to time at ridiculously inexpensive prices. For the usual Scatterers of adhesive eggs, a bunch of fine-leaved plants such as Colombia, Anacharis or bacopa, or several types intermingled, should be placed in about the center of the tank and weighed down with a small stone or led weight wrap. There should be plenty of room for the fish to swim, with suitable plants for them to attach their eggs easily, and enough room for about 200 eggs to be placed. Even the larger barbs and tetras (up to 3 inches) can be easily bred in the trusty standard 10 gallon tank, it is sort of the can-do member of your breeding team! A tank divider (available on-line or at most pet retailers) can make the separation of male and female much easier and less space consuming with many species. You will see in the instructions for each type of fish we suggest the male and female be separated and feed well on live high protein foods for 2 or 3 days before breeding. The type of divider should be designed for the size tank you are working with and go from flush with the bottom of the tank to flush with the hood or top of the tank. It is also suggested that the divider be opaque, or that it not be transparent so the male and female cannot see each other during the conditioning period. Adequate illumination must be provided with some species, while darkness is appropriate for others since many fish like a well-lit spawning area and others spawn in overhangs and dark overgrowths. See instructions on individual species for guides to lighting needs for breeding. The breeding tank should have a means for controlling temperature individually, a heater and digital thermometer is recommended, as it will sometimes be necessary to raise or lower the temperature to produce the required results. Again see individual breeding instructions for spicfic breeding instructions on different species. Some of the easiest egg scatterers to breed are listed here and linked to our easy to follow blogs on exactly how to breed them. We hope with this easy to follow about.com series of guides, you will be successful breeding egg scatterers. As always send us your questions and success stories! Buying a used 10-gallon tank or a used tank of most any size that is not set up and you see in operation with living healthy fish is an unreasonable risk to take. It is risking the containments that may be present or may have fallen into the tank as it set in the corner of a garage. You are also risking possible leaks that may be present, and this does not make sense when tanks are available new for so little money compared to the price of fish and the rest of the elements that make up an aquarium. The tank is one of the least expensive elements of your aquarium setup and unless it is a very large or special tank, should always be a new factory-fresh one. 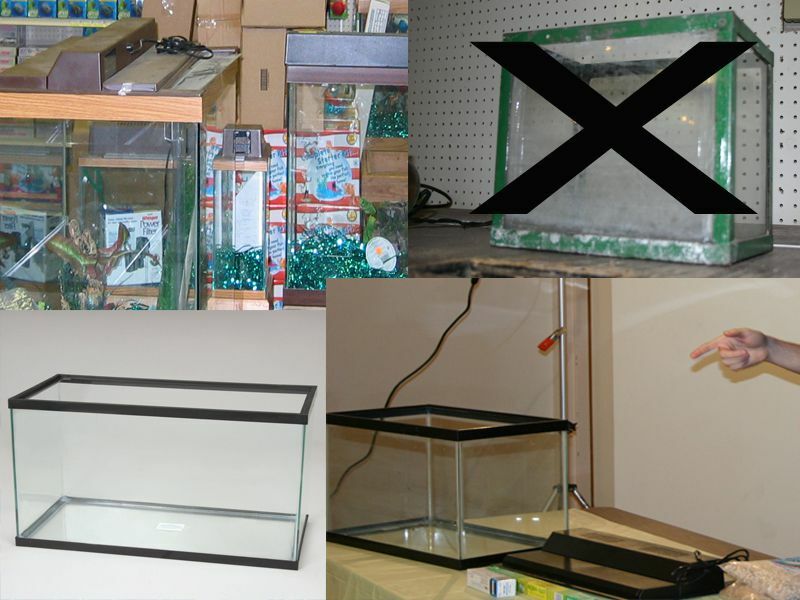 If the used tank was ever used as a home for reptiles, it should be avoided no matter how cheap the price, as it is unusable for tropical fish. The by-products produced by reptiles and left as residue within the silicon sealer will cause problems in a tropical fish aquarium for years. The problems these contaminants may cause in the breeding environment is obviously not worth the risk. Should You Use a Double Tank Stand?